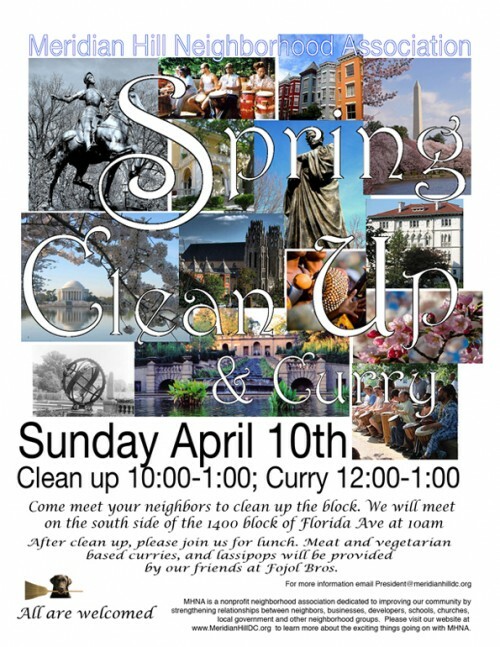 Come meet your neighbors to clean up the block. We will meet on the south side of the 1400 block of Florida Ave, NW at 10AM. After the clean up, please join us for lunch. Meat and vegetarian-based curries, and lassipops will be provided by our friends at Fojol Bros.
MHNA is a nonprofit neighborhood association dedicated to improving our community by strengthening relationships between neighbors, businesses, developers, schools, churches, local government and other neighborhood groups. Please visit our website at www.MeridianHillDC.org to learn more about the exciting things going on with MHNA.